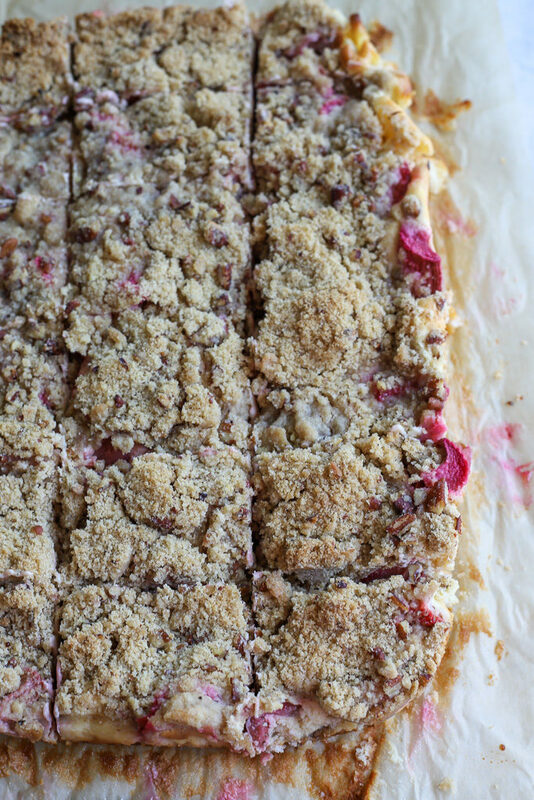 These strawberry rhubarb cheesecake bars are a delicious springtime treat. 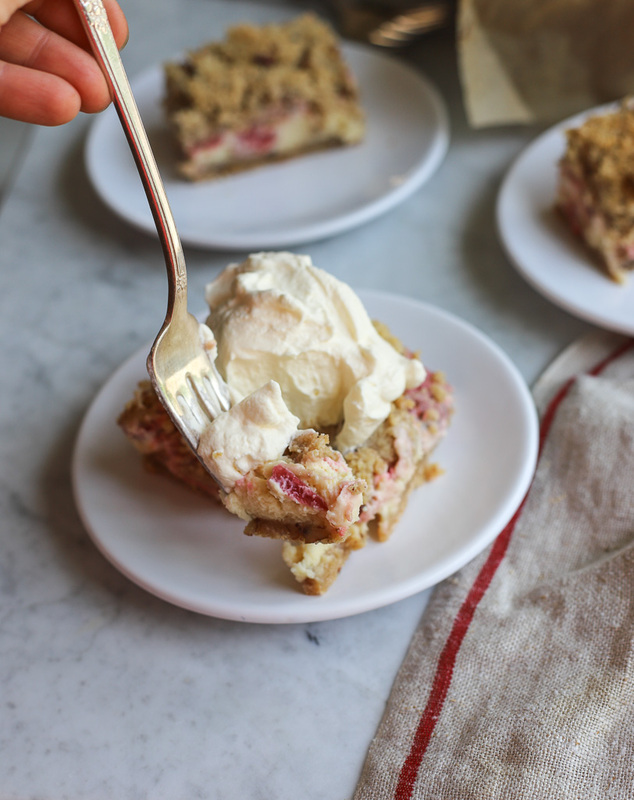 Perfect crust, creamy center, and a crunchy topping–this is sure to be your favorite way to use up some rhubarb! 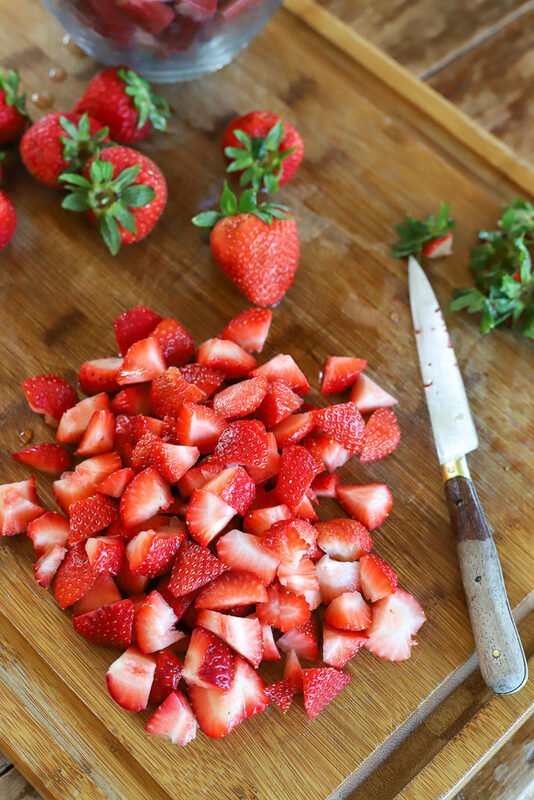 Strawberries and rhubarb go together like spring and showers. They’re the perfect complement to each other. 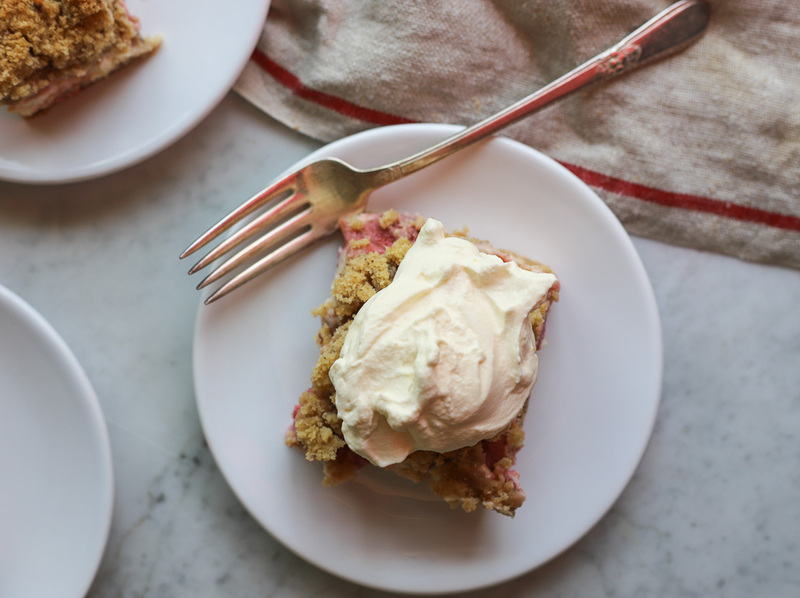 Strawberry’s sweetness pairs really well with the tanginess of rhubarb. 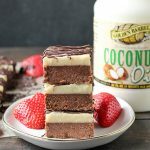 Actually, this dessert is a study in contrasts that blend together to make something amazing. 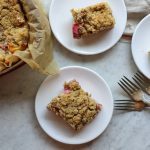 The crunchiness of the topping paired with the smooth, cream cheese filling, and the flavors of the fruit (strawberries) and vegetable (rhubarb) go together perfectly in this dessert. A couple summers ago, I planted a patch of rhubarb in our flower bed. I say flower bed because I can’t handle gardens. I know everyone else in Lancaster County has a garden in their backyard, but the best I can do would be a raised bed with minimal inhabitants in it. Instead I typically throw in a veggie here and there in my flower beds. Much easier to maintain 1 random rhubarb plant than have 17 that need weeded and more attention. So, anyway, I planted this one lone rhubarb plant in said flower bed a couple years ago, and shortly after we moved. 🙁 So I didn’t have a chance to harvest any of this sour vegetable. Bummer. 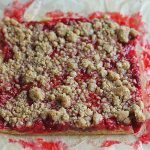 But the good thing about living in Lancaster County is that there are approximately 743 farms within a mile radius of your house who sell rhubarb at their roadside stand. 😉 I exaggerate slightly on that number…but seriously, rhubarb is plentiful around here in the spring. 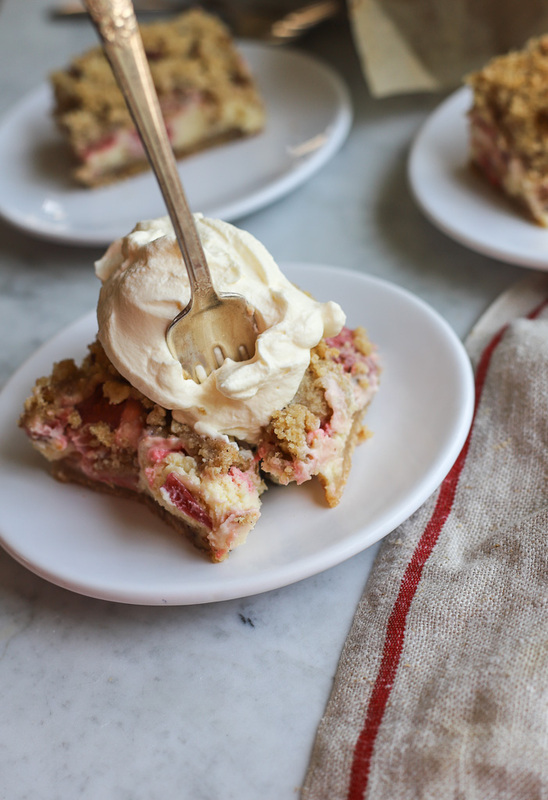 And my husband is a big fan of rhubarb. So I stopped at one of those stands and bought a rubber banded-wrapped bunch and got to work. I recently visited The Cheesecake Factory with a friend, so I had cheesecake on my mind. Instead of going all out baking a typical cheesecake, I decided to make cheesecake bars. Seriously, if you want to make something easy, go the bar route. They’re hard to mess up. 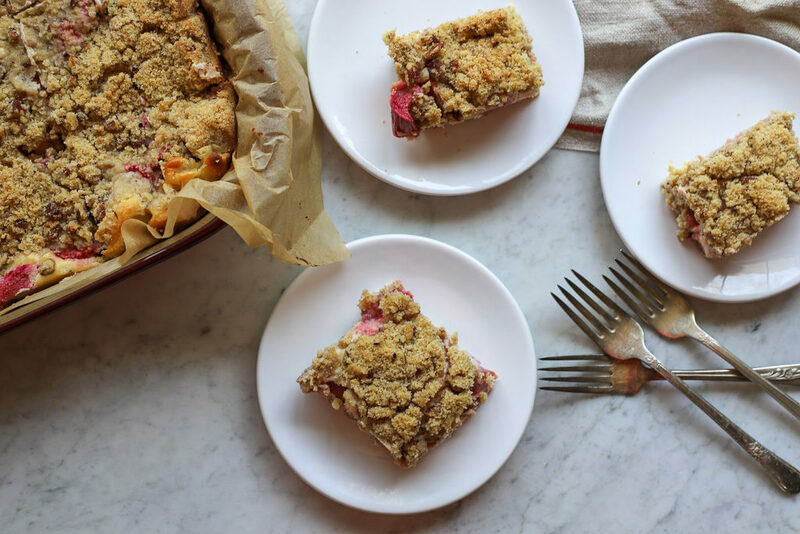 Maybe you’ve never tried rhubarb before. I feel like it’s a country thing. I never had it growing up in Jersey, but like I said before–it sure is plentiful here in the PA Dutch Country. You should totally try it. My whole family loved this dessert. I even brought some to our friends’ house and it was a hit. Kids and parents alike scarfed it up. 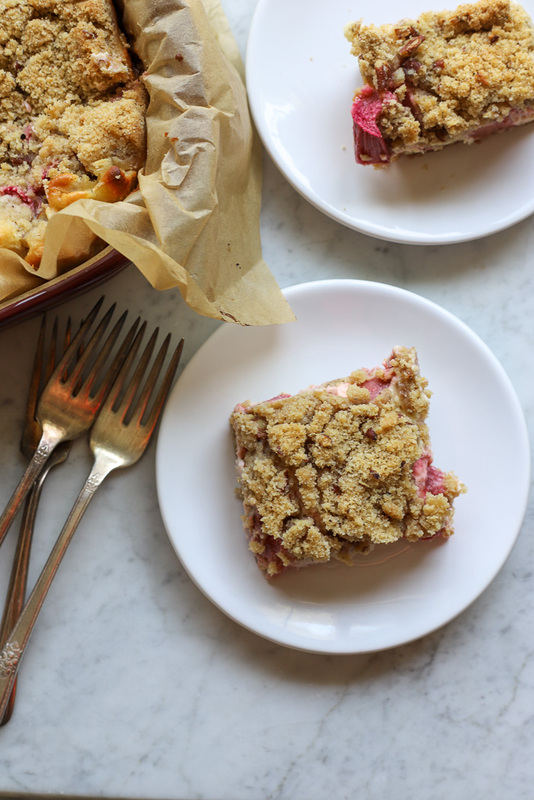 So before rhubarb season is out, give these cheesecake bars a try–you’ll love them! Preheat oven to 350 degrees. 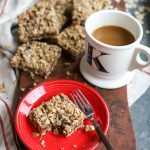 In the bowl of a stand mixer (or with hand mixer), mix together flour, brown sugar, pecans, and butter on medium speed until butter is pea-sized and mixture looks like coarse crumbs. Pour half of the mixture into a parchment-lined 9x13" pan. Press into pan and bake for 10-15 minutes or until lightly browned around edges. 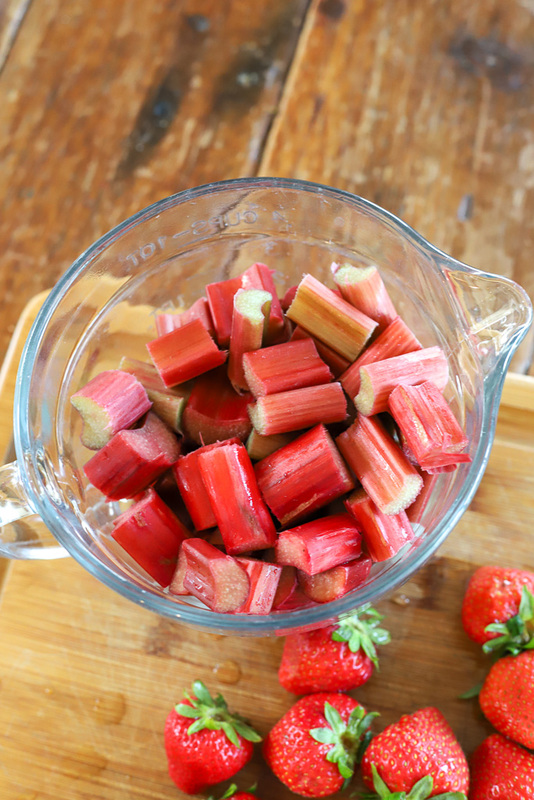 In medium-sized bowl, mix together rhubarb, strawberries, corn starch, and 1/2 cup sugar. Set aside. In the bowl of a stand mixer, mix together cream cheese and remaining 1 1/2 cups sugar until light and fluffy. Add eggs and vanilla on medium until smooth. Pour cream cheese mixture on top of crust and spread evenly. Evenly pour strawberry mixture on top of cream cheese. 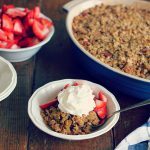 Top with remaining crumb topping. Bake for 40-45 minutes or until edges are browned and middle is slightly wobbly when shaken. Cool on cooling rack for 1 hour then refrigerate for 3 hours or overnight. Refrigerate leftovers.